I have just finished painting fifty horses and cavalry men , it’s my first go at painting horses I usually shy away from them but this time I had no option but to bite the bullet and go to it. After a bit of research and some practice it wasn’t to bad and towards the end was a bit of fun, I never realised horses colours and makings were so varied. Well on to painting the infantry and a bit of hedge making, I have a plan to use a tip from TIM’s tree making blog to make the hedges, I’ll post the result if it works out. I have just added a few more horses that I’ve come across in a stationary position, thus allowing the cavalry to discharge their pistols as was the case. I have also included a few different charging poses that came with the set I used- Revell Austrian Dragoons and Prussian Hussars 7 Year War. 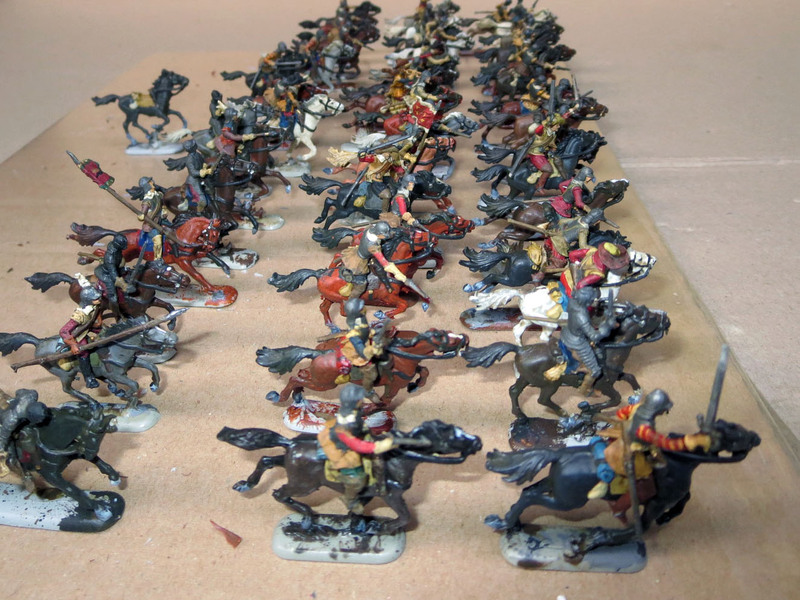 I have also converted a few of the Austrian Cavalry men into ECW cavalry. You might note I have added pistol holsters to the horses that I modelled from the Revell set. You have been busy Pat! Looking great and to think they are your first horses, brilliant. Looking forward to seeing the completed diorama further down the line and what you’ve got in store for hedges! Thanks mate ,not my first horses really, I’ve done the odd one or two but this was my first foray into painting a large group . I have got my hands onto some coir fibre twine from a nursery which has turned out perfect for the job as you will see soon . Either way mate great work so far. Looking forward to the updates! Damn that’s a lot of cavalry. Might be more than I’ve painted in my entire life! I wasn’t to keen at the start, but I made myself do them before I the infantry, that way Couldn’t weasel out in the end and only paint a few as has happened in the past . Well done with this lot! They look really good charging en masse! I hate painting horses and usually opt for brown and black as they’re easy to paint over a black shade coat, but I bought a kid’s book on horses and it’s really good for colours and markings! Am looking forward to seeing your new update. Thanks mate ,funny that, I used a book I picked up at a second hand store for pointers . Wow these are very impressive, especially because they’re 1/72 scale. Sorry it’s taken me a while to follow. No excuses but I’m bloody on board now!!! If you are as time poor as me mate you have one good excuse mate ! ,thanks this is my first go at painting masses of horses and I certainly got a lot of practice . I have nearly finished the infantry and am working on some hedges but the cold weather isn’t helping so I probably put off putting all together after I get back from the UK holiday and the weather is a lot warmer .